From dead battery sadface to that glorious 100% charged feeling in a matter of seconds. When your phone’s battery reaches that critically low point, recharging it seems to take eons. If it’s your electric car’s battery that’s low on juice, then having to wait for a charge might be more than an inconvenience if you’ve found yourself stuck somewhere miles from a charging station. What if you didn’t have to wait hardly at all for your phone to be back in working order? Or to get your car back on the road? What if you only had to wait a few seconds to go from dead battery to that glorious 100 percent charged feeling? Donald Highgate, director of research at Superdielectrics Ltd. and his team have set out to make that vision a reality. Highgate’s team has created a material that amps up the potential of supercapacitors – devices that can both charge up and release their energy rapidly. Their capacitance for storing energy is “super” because it’s both electrostatic and electromechanical. Therefore, supercapacitors (also called “ultracapacitors”) are kind of like a mashup of normal capacitors and a normal battery. Highgate has teamed up with researchers from Bristol University and Surrey University to create a supercapacitor that’s not just better than traditional batteries, but that could one day be superior to lithium-ion batteries. So how do they plan to do it? Here are four things to know. The material Highgate’s team is using actually got its start as the basis for high-tech contact lenses. The soft, flexible material turned out to be really good at holding an electrostatic field — which was just what they needed, as that’s how supercapacitors produce their energy. Supercapacitors don’t create electricity in the traditional way though: they create electrostatic fields. They also only store comparatively small amounts of power; good for jump-starting batteries in devices like your phone, a car, or a train, but “jumping” a battery is not quite the same as providing a steady supply of power. They’re also quite costly and therefore aren’t likely to be a consumer’s first choice. Other than cost, one of the prohibitive limitations of supercapacitors compared to lithium ion batteries is that they have poor energy denisity: they can’t hold very much energy, and they can’t hold it for a very long time. That’s why supercapacitors in their current form wouldn’t be great for keeping electric cars charged — you’d have to re-up every couple of miles. Highgate and other researchers working on similar projects are extending the power and range of supercapacitors with materials that enhance these abilities. They don’t necessarily have to be special or rare materials, either: Materials like the soft polymers originally meant for contact lenses that Highgate’s team is using or the graphene-based materials that can super-charge a supercapacitor’s energy-storing power are fairly accessible. 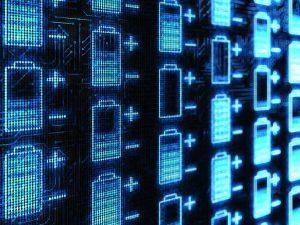 While the long term goal may be for amped-up supercapacitors to surpass lithium-ion batteries as the go-to power source for devices, cars, and assembly lines, in the short term it’s more likely that they’ll be used together. When working in tandem, the two create a very strong, reliable power supply — which is especially good news for electric vehicles. Highgate’s polymer and the other souped-up supercapacitors are very much still emerging solutions that may not be available for years yet. But as the world strives to move toward renewable energy, we’ll need a broad range of sustainable, affordable, alternatives to our traditional energy networks. And faster phone chargers would be cool, too.